Every person should work in customer service at least for a little while. Not only does it teach you how to get through a stressful situation, but shows you just how much tears and laughter go into your every order. Kerri H. from Auckland, New Zealand, knows this. She’s been in the industry for years and has seen it all. Recently, she decided to share some of the surprising experiences she has had to show that people behind the counter have the same feelings and emotions as the ones who are making the orders. And judging from Kerri’s stories, boy do they get needy. But she knows how to keep her cool and her experience is probably what helps her a lot. “I have been working there for 5 years and it’s my first permanent job. I did other temp jobs like event catering and service as well as worked in a tiny cafe casually,” she said. Our Iced coffees are a fresh espresso shot poured over ice, a scoop of vanilla ice cream, cold milk and a swirl of whipped cream. 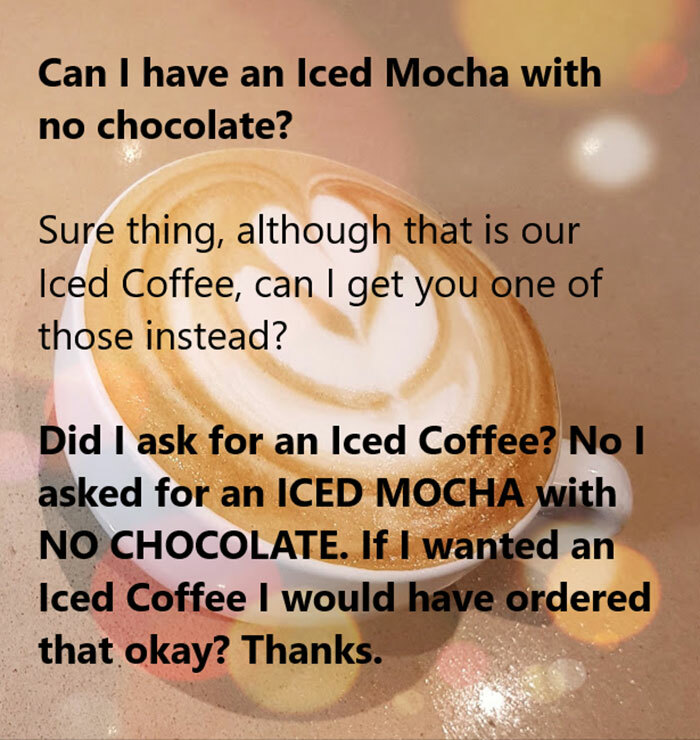 Iced Mochas are the exact same drink but it has chocolate syrup added to it. That’s the only difference. I did explain it to her but she had already made her mind up. Extra dollar to the store I guess. The way she said “Thanks” really riled me up because truly, it doesn’t get any better than this as I really love a condescending tone of voice. This gentleman is older and likes to think of himself as very money savvy, he’s a regular at our store and has an incredibly tight budget. This fella ordered our all day breakfast choice of Eggs on Toast, with an additional side of bacon, (which is two eggs cooked to your liking and two pieces of toast with a fried tomato for $12, a side of bacon is two rashers for $4 which comes to a whopping total of $16) We aren’t heartless and if we know there’s a cheaper option we always tell our customers. 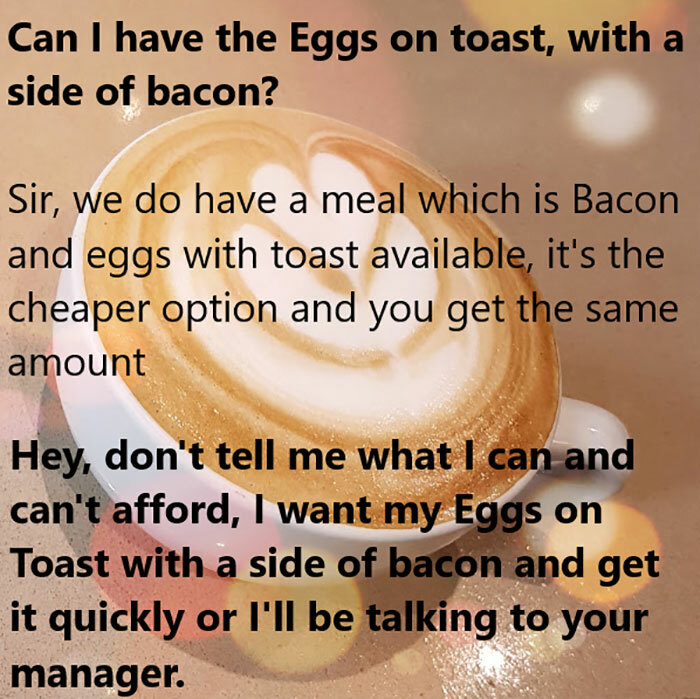 The meal we were trying desperately to convince him to buy is $13.50 and comes with everything he wanted, two rashers of bacon, two eggs, two pieces of toast and a fried tomato. We gave up and he left thinking he had gained the upper hand and scammed us all, his smug smile is one I will never forget. I don’t work at a Starbucks. We are franchised and have a very similar feel but I cannot stress the fact we aren’t Starbucks any harder than I already do. I don’t know Starbucks sizes, I get told “Tall”, “Grande” and “Venti” more times than I can count and genuinely have no idea what those sizes are. We have small, medium and large. I have said countless times that the coffees we offer aren’t like Starbucks but customers are always sure what they’ve ordered will be just like they expect. This coffee, in particular, is the bane of my existence because no matter how many times I repeat we don’t make it like Starbucks they always insist that it will be. Ours comes as long or short and is literally only a shot of espresso with fresh foam gently floating on top, it makes three distinct layers and is actually a very pretty drink. 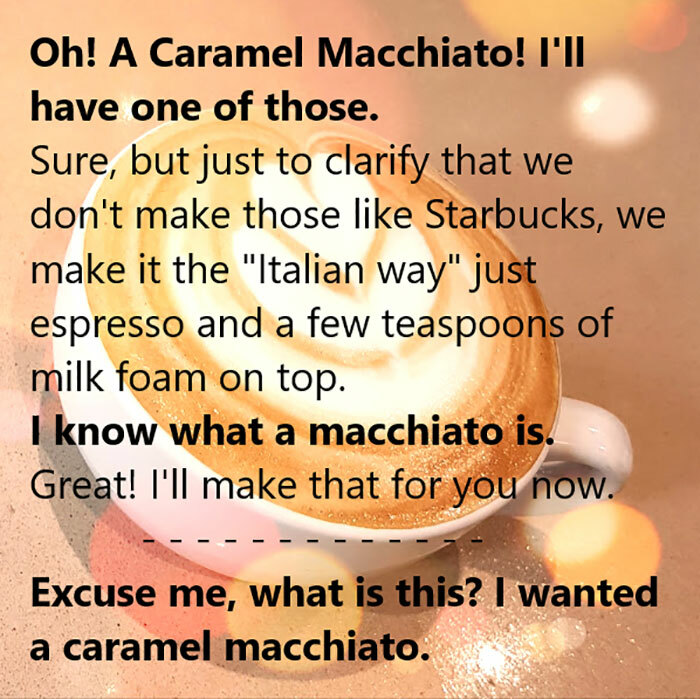 Starbucks caramel macchiato is very different, although I do know how to make it like Starbucks now because I get yelled at about it so often. This one was a personal victory for me. It’s actually the one and only time I was so awful and petty to a customer that part of me regretted if for the slightest moment. A secret of mine is that I have always wanted to sass a customer as you read online, where a person asks to see the manager and the staff member does a flamboyant 180-degree spin and says “That’s me” I got to live that dream. This was a few years ago and as stated in the image it was Valentines Day. A customer had come in an hour or so earlier and booked a table for his girlfriend and himself and left some table decor he wanted to set the table up with. I offered to set up roses, LED candles and cloth napkins for them both so he could leave to get ready. I finished setting up the table when in walks Mr. Businessman. The store is basically empty at this point, it’s 4:30 in the afternoon, too early for the dinner rush and so there are lots of tables free. Mr Businessman walks up and asks to use the table clearly set up for a romantic night. I politely say it’s been reserved but there are many other tables he can take a seat at, but he insists that he have that table. I take him to the table directly next to it and say this table is free, but he doesn’t want that seat, he wants the reserved seat. He starts to raise his voice and at this point I can see he is choosing to be difficult for no other reason but to be difficult. 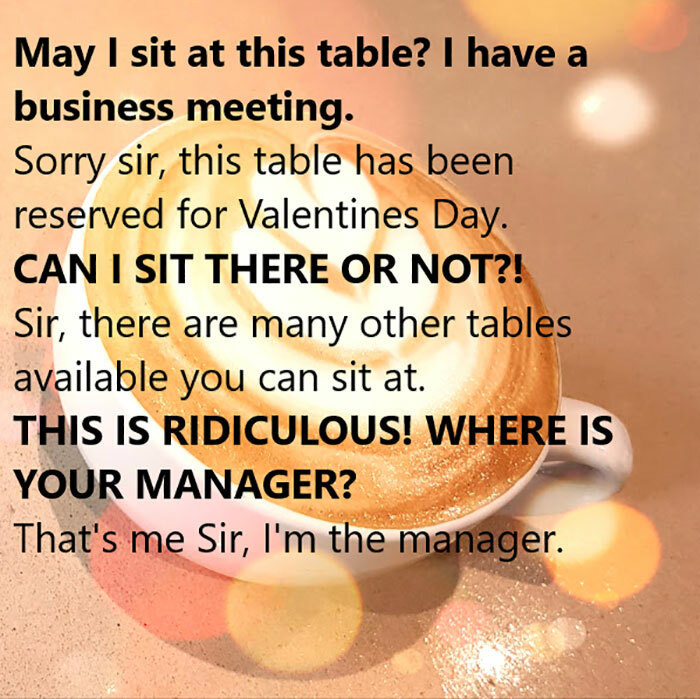 I repeat myself that that table is reserved and that’s when he says it. He asks to see the manager. I feel the moment spread through my whole body, starting from my suddenly beaming smile all the way to my fingertips and overworked feet, I feel the power I suddenly posses flow over me. This is it, this is my moment. I look around and then down at my name badge and gasp as it says “Manager” under my name, I smile and say “That’s me, sir, I’m the manager”. I was being awful and petty and he’s beyond angry at this point and raises his finger, stabbing the air around me and says “WHAT’S YOUR NAME?! I’LL BE REPORTING YOU TO HEAD OFFICE” I point at my name badge again and spell out my name “Make sure you spell my name correctly, so many people tend to misspell it”. He leaves in an angry huff and says he’ll be taking his business elsewhere. He ended up returning an hour later and is now a regular at our store, he greets me by my name every time he comes in. This is pretty self-explanatory. We get a lot of what I assume people would call “Soccer Moms”. So many orders like this come through and its always from people wearing yoga pants, carrying a Versace bag and wearing really heavy gold chain necklaces. They also always have a phone pressed against their face and a call that they absolutely CANNOT hang up on. 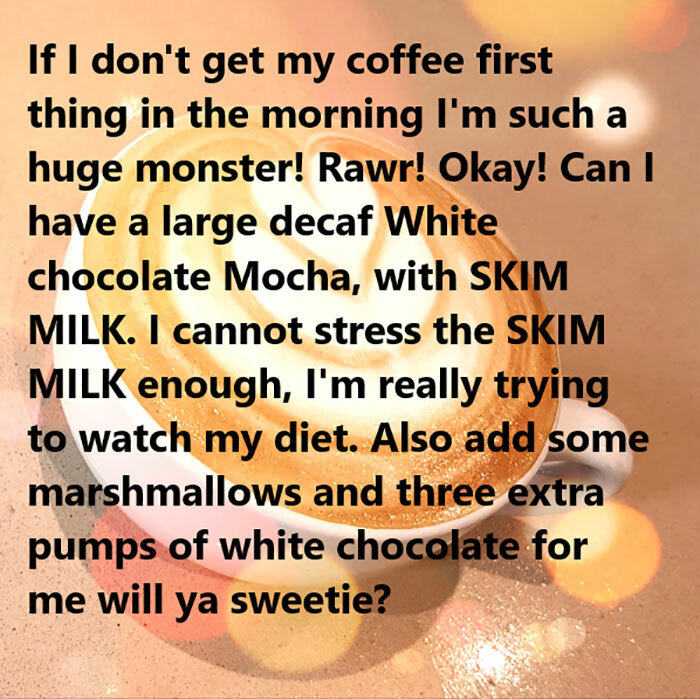 I do understand that Skim milk can be a little more gentle on tummies that struggle with lactose (or so I have been told) so I always ensure that the milk is the correct one but it always seems oddly unnecessary for “diet” reasons when you essentially have half a cup of syrup and marshmallows. Also! A little note for people who love sugary drinks, don’t EVER be ashamed of what you’re ordering. I don’t care if you want ALL syrup, I don’t care if you hate coffee, but it’s my job to ensure you get exactly what you want and you leave with the exact drink you want. Don’t pretend you don’t want any sugar when you truly want 8 but are too embarrassed to say so. This was on one of our most busiest days of the year, we have two days a year where we make triple what we do on any other usual day, and our shop was full to the brim. A couple came in and sat down at a table set up for 12, there were multiple reserved signs scattered on the table and had menus and cutlery all set up ready to go when the couple sat down at it. I went over and politely asked if they would be able to move to another table, I apologised for the hassle and hoped that they would be understanding as they had just taken their seat and hadn’t settled in yet. 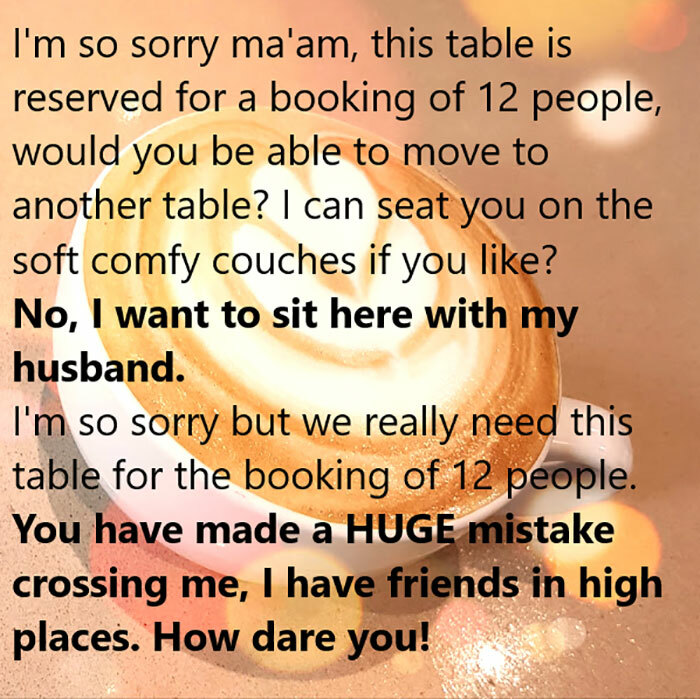 The wife immediately got angry at me and said very loudly “No, my husband and I want to sit here.” I pointed at the giant table that they had sat at and reiterated that it was for a table of 12, if she wanted extra table room she could have a table for four but just not THIS table. Behind me I had gotten my coworkers to clear a table with soft couches for her and her husband to sit at. The table of 12 had started to arrive and there was absolutely nowhere else they could sit unless she moved. I was desperate at this point and practically begging her to try the couches to see if she would like that instead, I even offered to give her a meal on the house if she chose to. She looked at her husband and slammed her hands down on the table, snatched the menu out of his hands and threw it on the floor. She pointed in my face and said what she said in the image “I had made a very powerful enemy”. She ended up writing into our head office complaining about how she was treated badly by the staff and that their entire day had been ruined because they hadn’t been able to be served at any local restaurant because they had all been booked out. All she needed to do was move one table over. Her friends in high places turned out to be a person who had a high ranking on Zomato. She also comes in every now and again and always says what a wonderful time she has had. This might seem a little complicated to understand, but it’s not really once you break it down. Our toasted sandwich menu starts at $3, $3 is for the bread and for each filling you choose it’s worth $1, so a toasted sandwich starting at $3 with two fillings is $5. We have a small part of the menu where it breaks it down for you to make it easier to understand and so when you’re choosing your fillings you will know exactly how much it will cost. This young woman works in a store nearby and said she wanted the two filling sandwich and then ordered six fillings which comes up to $9. 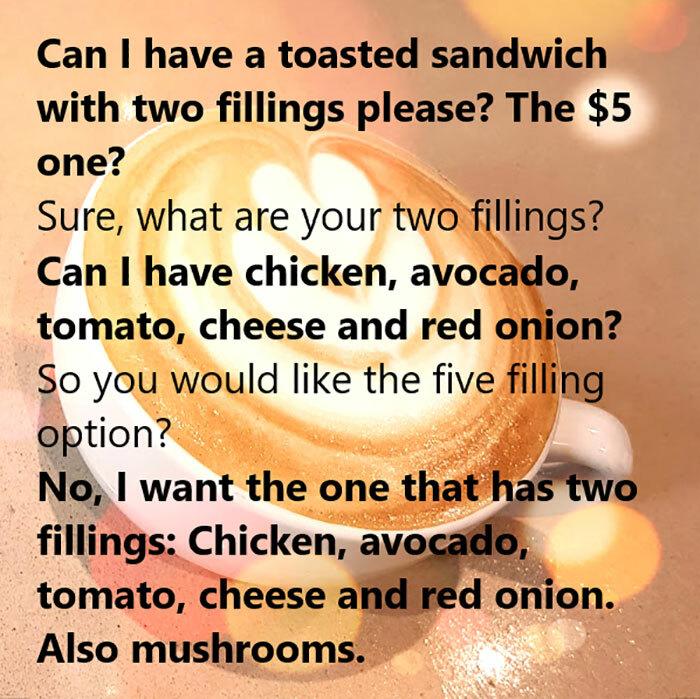 When I told her the price for it she was confused and said: “I want the two filling toasted sandwich” then listed six fillings. I broke it right down and explained why it came to $9. She nodded understanding and said she would be right back as she had left her wallet in her office. We made the sandwich, trusting she would be back when I saw her walk past five minutes later with a meal from a neighboring store. She ended up coming back to our store about 6 months later and did the same thing with ordering the two filling sandwich and ordered six fillings so I explained how it all worked out to her and had an “Ah-ha!” moment. She purchased the sandwich and continues to do so every Thursday afternoon. This was an email sent straight to our Head Office. Any and all complaints can be sent to them through a contact page or Facebook, but this one was sent anonymously through email. 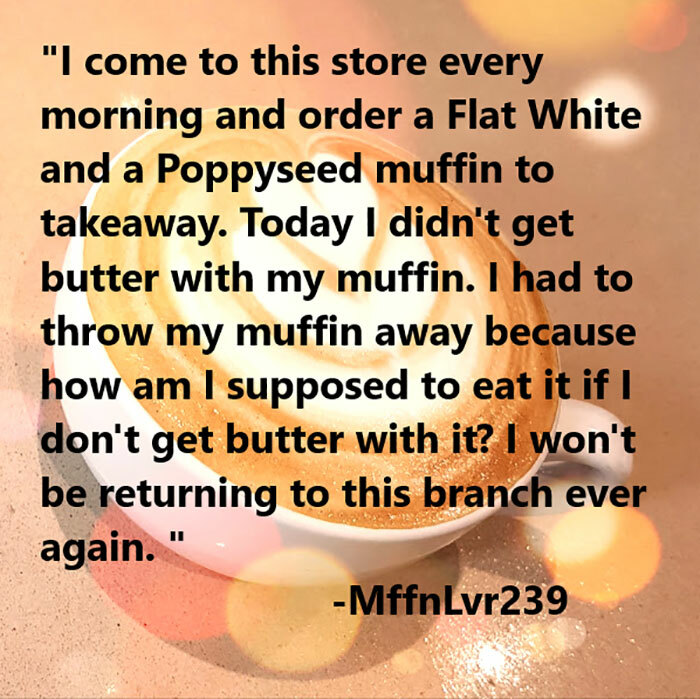 We got sent the email and the correspondence that Head Office had with her and even they didn’t understand why she threw the whole muffin away because she didn’t have butter with it. The customer works in a place that would have butter on hand as well. She also sent it anonymously to avoid us knowing who she was but we all knew because she was the only person to make that order that day. A good rule of thumb I have picked up too is if a person is being rude and then says “I come here all the time” or “I’m a regular here” they are neither of those things. I’ve worked at this particular store for over 4 years and I work very long hours, so I get to know the people who are regulars and I know if you come to the store regularly. This lady had come to our store twice in the past. I don’t know why so many people think that being a regular or coming to places all the time gives them some sort of authority over things as if frequenting a place means that they get to dictate how we do our jobs. It boggles my mind every time they say it. She also returned two or three times later and we made sure to put two butter packets with her muffin each time. 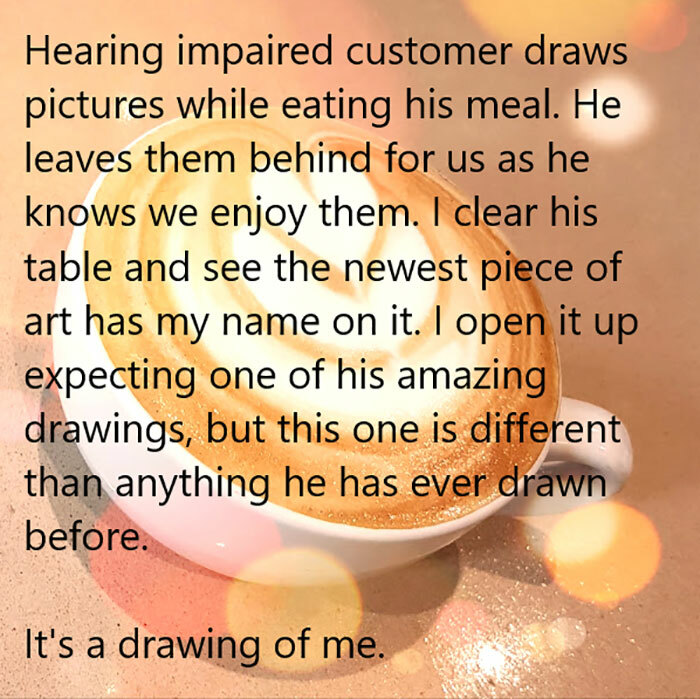 I point out that he is hearing impaired because the only way we can communicate is by writing each other notes so he always has a notebook and a pen or pencil with him. The whole entire staff know him because of his talent and when he enters the store we all wave hello to him. I have taught myself how to say hello and how are you in sign language too which is always nice to do and makes him smile. There’s not much more to say on this one. 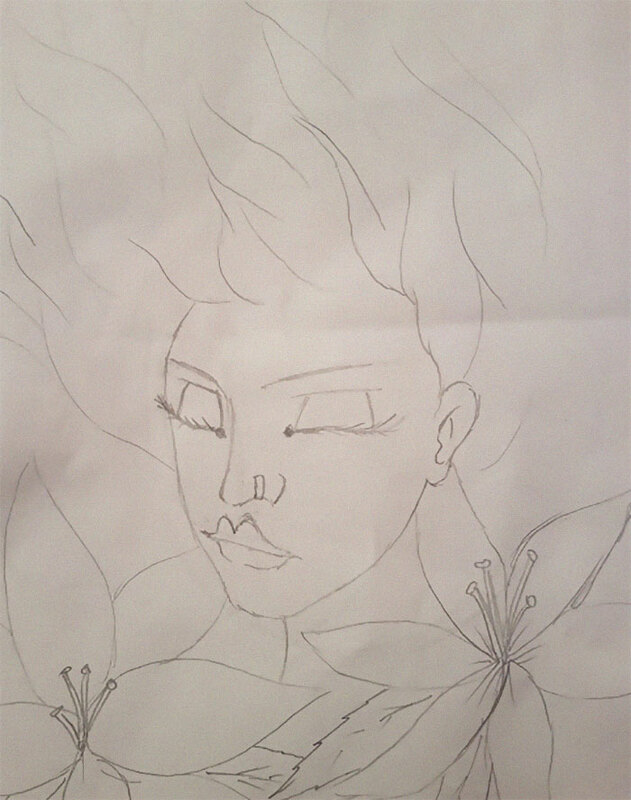 I still have the drawing hanging up in my bedroom. It was a quick drawing he did in about 10 mins while eating a sandwich. It’s funny as at the time I was going through a really tough time, I was exhausted from work, had barely slept and when I got this gift I was practically in tears. I’m sure he has no idea how much it meant to me that he chose to draw me but I will always treasure it. I saved this one until last because even though I have had some really rough experiences while being in this career, or even just this current job, I have also had moments where my breath has been taken away. I have had moments where a customer has treated me so kindly and made me feel so respected and like I was part of their family. I have seen women pregnant and then seen that baby grow up right in front of my eyes and run to hug me when they come to have dinner. Its moments like that when I’ve worked for 14 hours straight and have another shift starting in 8 hours to help get me through it. I have had people lose someone close to them and have no one else to turn to in their time of grief where I lend them a listening ear and a cup of hot tea, something small but can mean the world to them. Or when my elderly customers pull out their iPads and show me pictures of their sons wedding, the pride beaming from their smiles. Its moments like those I remember when I have people raising their voices at me. Oh, and the best part? 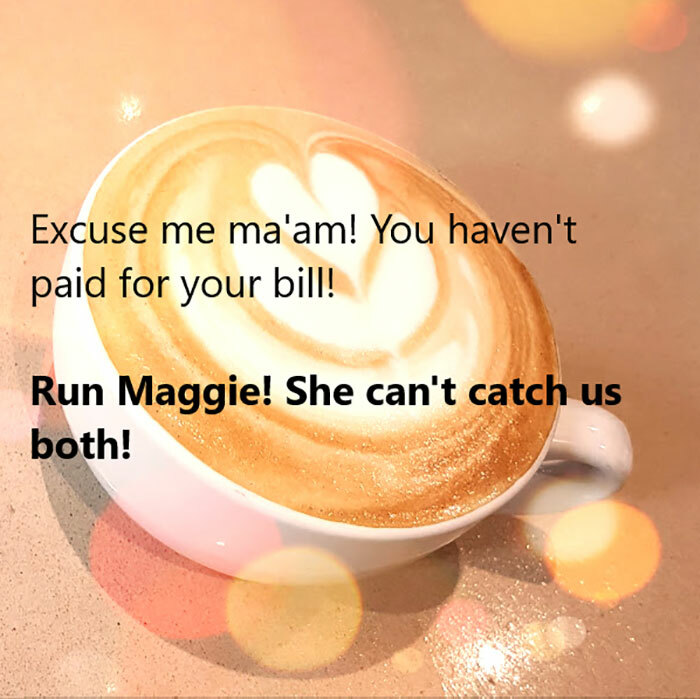 The background pic with the coffee is an image she took personally after making that cup herself!